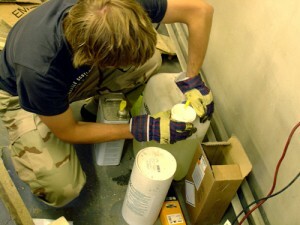 Epoxy, a key factor in our ship building and preparation process. When we started looking for an epoxy resin, we faced difficulties. The main difficulty is the massive variety of opinions different people have. One says that you can use polyester, the other says that you can use epoxy. Okay, polyester is not that good and does not create as good as a bond as epoxy does. We did not want to build something that would fall apart very fast, so we decided to go for epoxy. Which epoxy to buy? Wow it is expensive. You certainly would not buy it for putting wallpaper on the wall. Where to get the cheapest? We asked around, again opinions varied. What we went for, in the long run, was a combination of high quality epoxy and low quality plywood. The reasoning being that we will fiberglass the whole boat. This means that we basically only use the plywood as a medium for giving a thinner kind of fiberglass hull some shape. 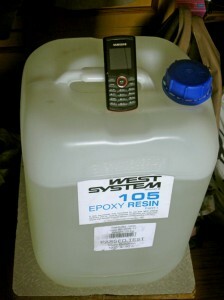 We bought 25kg of West System 105 resin and 5kg of West System 207 hardener. A total of 30 kg (probably will need two times more). The company we bought the epoxy from has a very good reputation. Their web page offers tons of materials to help you choose which mixture to buy. Customer support was good, even here in Estonia. These mixtures are specially designed for marine use. West System has published books on boatbuiling. Basically saying, we did not save up on our adhesive, but hit the gas pedal hard. If you ask for what kind you should buy when you want to build a boat – well here is the painful answer – you choose. Dig hard and dig deep in the information you can get. We consulted with professional boatbuilders, amateur boatbuilders and so on. Gather information, consult with someone you trust, look at your budget and decide. What we do recommend, whatever epoxy or adhesive you get, is to use mixing pumps read more here). You will save a lot of money and time. They do not cost that much. On the picture you can see Joosep pushing down on the epoxy dispenser. The hardener is the smaller metal canister in the middle of the picture. The ratio is by default 1:5. Another thing you see on the picture is a cardboard tower of epoxy filler (read more here). We bought a West System low density filler, as recommended by John Welsford. It is actually a good thing to have, as you can change the properties of your mixture. Our plywood has a rough surface, clear epoxy would simply soak the wood and leave a dry joint. adding the filler to the mix creates a thicker resin that fills all the gaps in the joint, yielding a stronger final product. Also, our filleting is done with this low density filler. It is easy to sand after it has dried.